Shutters are a classic, timeless and low-maintenance window treatment solution and thanks to DIY Online Blinds, they’re now affordable and accessible to everyone. Gina recently installed bathroom shutters in her ensuite and main bathroom (pictured) to hide the not-so-pretty frosted glass windows and offer privacy when the windows are open. Provided you can use a measuring tape and a drill, you can install these luxe window treatments yourself. 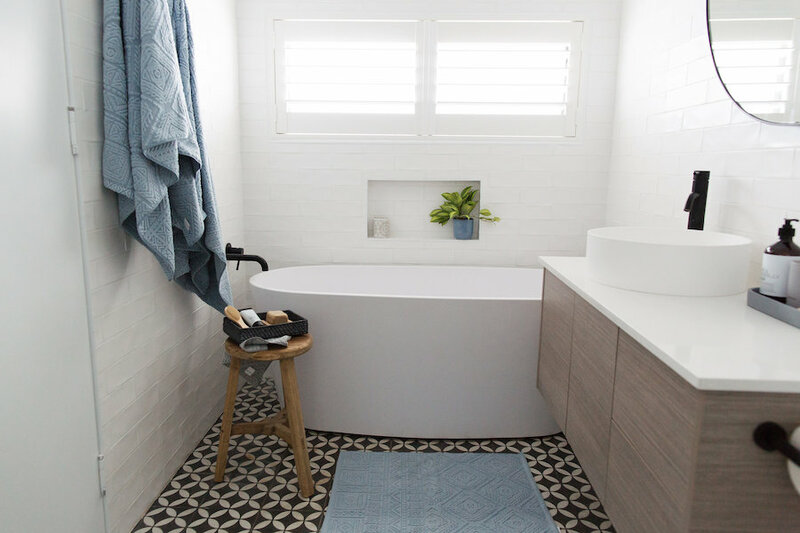 Rapid Renovation expert and guest contributor to Style Curator, Naomi Findlay, shares just how easy it is to do this in the videos below. 1. Decide where you will mount your shutter – will it be recess fit (inside the window frame) or face fit (outside the window frame). We love the look of recess fit but you do need to have a 65mm depth within the window frame to allow for the shutters to open and close with ease. It’s also important to look for obstructions like handles and winders that may prevent you from using recess fit. 2. For a recess fit: Measure the inside of your window width from left to right at the top, middle and bottom of the window and submit the smallest measurement. Then measure the drop of your window from left to right at the left, centre and right-hand side of the window and submit the smallest measurement. 3. For face fit: Measure the outside frame of your window width from left to right at the top, middle and bottom of the window and submit the smallest measurement. Then measure the drop of your window from left to right at the left, centre and right-hand side of the window and submit the smallest measurement. Note: Things get a little more complicated when you have an oversized window or a mullion so refer to this handy measuring guide on the DIY Online Blinds website for further info. 1. Construct your frame on a clean surface (it’s a good idea to do this on carpet or a blanket to avoid scratching your frame). Each piece is clearly labeled so it’s simply a matter of slotting them together. 2. Mount your frame. If your shutter is recess fit, it will sit inside the window, whereas if it is face fit, it will fit on the outside of the frame. Naomi clearly explains the different mounting techniques with handy graphics in the video above. 3. Attach your panels. This simply involves lining up the bracket on the frame with the hinge on the panel and dropping the hinge pin to secure them in place. 4. Check they open and close with ease. 5. Cork the edges to hide the gap between your window architrave and the shutter frame for a professional finish. 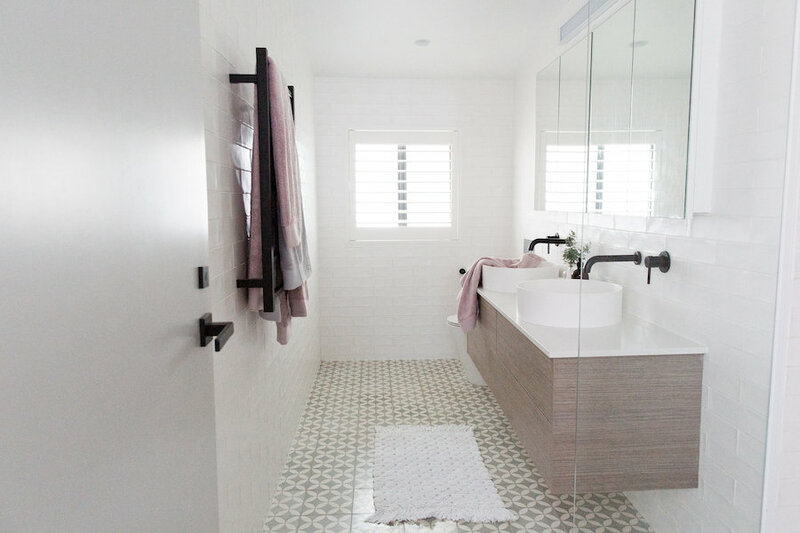 If you’re looking for window solutions for your bathroom, or for another room of the home, you can find more information on the DIY Online Blinds website here. Do you have any questions on how to measure and install your own plantation shutters? Pop them in the comments below and we’ll get the team at DIY Online Blinds to respond ASAP. One thing I love the most about your blog is that you explain everything in the most simpler way 🙂 THANK YOU SO MUCH, GINA!